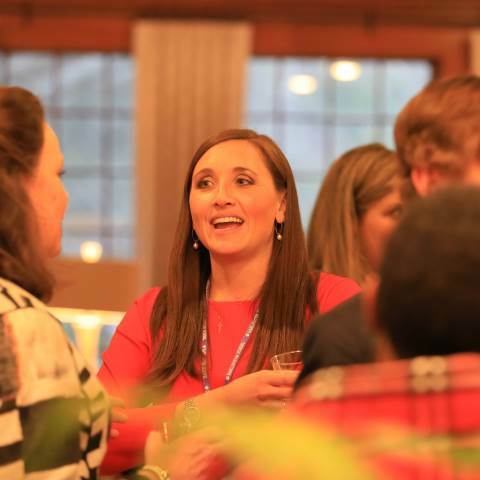 Leadership Darlington is a prestigious and competitive opportunity for Darlington School alumni to connect with their alma mater and school leaders on an in-depth, personal level. Designed to develop the next generation of alumni leadership, the two-day retreat provides an integrated view of the school and includes opportunities to talk with students, faculty, and senior administrators about Darlington and its future. Express interest in Leadership Darlington! Leadership Darlington participants are selected based on the information they provide during the application process. Qualities considered include leadership involvement in professional, community or faith-based organizations as well as recognitions and personal achievements. Diversity in gender, age, occupation and geographical location are also key factors in the selection of class members. To ensure you are included in the application pool for the next available class or to nominate an alumnus/na for the program, please email alumni@darlingtonschool.org. This year's retreat will be held March 3-4, 2019. "Leadership Darlington was a great experience for me. I feel like I bleed purple and white each day living in Rome, but it was a real eye-opener to see how Darlington is such a vital part of so many alums – and they don't get to experience it every single day, as I do. I am so very lucky to have been given the opportunity to go to school at Darlington and now to give back each day to a place that holds so many memories and has shaped my life immensely." "The Leadership Darlington retreat was one of the best weekends of my life. The values and drive to succeed that Darlington gave me is an inner strength for me every day. The sense of community, passion, and commitment to Darlington is still in each of us. I am amazed at how easily the walls come down being with other alumni from all generations and talking about the unforgettable memories that we all have." "I felt like I got the inside track on the challenges and opportunities confronting Darlington and how my alma mater is preparing her graduates and herself for a bright future. The retreat allowed me to tap in to a special network of administrators and alumni who are committed to excellence in all that they do, and I look forward to working with them to enhance Darlington as well as myself"
"This past weekend I gathered with 22 other individuals with different skills, different talents, different passions, different personalities, and different backgrounds. Yet with all those differences, we met and worked together and discovered that part of what made us who we are was the confidence, the self-assurance, the love of life and learning we received while students at Darlington." "Leadership Darlington was a wonderful experience for me in terms of understanding the value of my own time there as well as the value of a Darlington education today. These are some of the words of the students we met, when asked about their Darlington experience: curiosity, leadership, encouragement, community, tradition, opportunity, diversity, and transforming. I don't think my words could improve upon theirs."